The recommendations stemming from the RIRDC report: Development of an Internationally Competitive Saffron Industry and the subsequent PhD thesis by Dr Gregory formed the basis for this project. 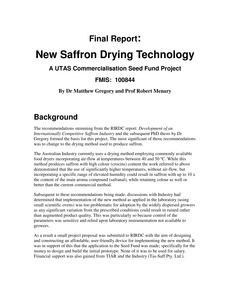 The most significant of those recommendations was to change to the drying method used to produce saffron. The Australian Industry currently uses a drying method employing commonly available food dryers incorporating air-flow at temperatures between 40 and 50 ºC. While this method produces saffron with high colour (crocins) content the work referred to above demonstrated that the use of significantly higher temperatures, without air-flow, but incorporating a specific range of elevated humidity could result in saffron with up to 10 x the content of the main aroma compound (safranal), while retaining colour as well or better than the current commercial method. Subsequent to these recommendations being made, discussions with Industry had determined that implementation of the new method as applied in the laboratory (using small scientific ovens) was too problematic for adoption by the widely dispersed growers as any significant variation from the prescribed conditions could result in ruined rather than augmented product quality. This was particularly so because control of the parameters was sensitive and relied upon laboratory instrumentation not available to growers. As a result a small project proposal was submitted to RIRDC with the aim of designing and constructing an affordable, user-friendly device for implementing the new method. It was in support of this that the application to the Seed Fund was made; specifically for the money to design and build the initial prototype. None of it was to be used for salary. Financial support was also gained from TIAR and the Industry (Tas-Saff Pty. Ltd.). The RIRDC project began in October 2010 and is ongoing until October 2012. This report is therefore only an account of the initial phase of the project involving design and construction of the initial prototype. Testing of that prototype has just been completed (during April-May 2011) and so while a preliminary account of the results can be given in this report, it will not be a definitive assessment of the success of the project as the work is ongoing.